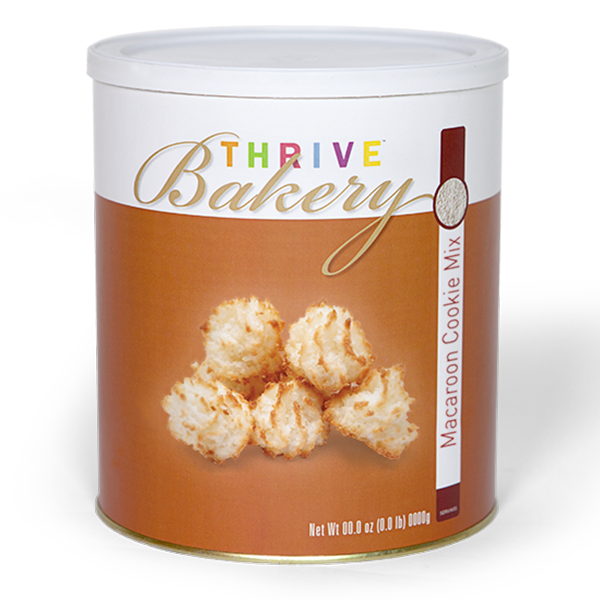 Make scrumptious macaroons and cookie bars in minutes with Thrive Macaroon Cookie Mix! With no artificial colors or flavors, no hydrogenated oils, and specialty ingredients like organic coconut flour, this mix is the best around. Add ½ cup hot water to 2 cups THRIVE Macaroon Cookie Mix. Allow batter to sit 3–5 minutes. Bake at 350°F for 15–20 minutes or until edges are golden brown. Makes 13 cookies. This mix makes irresistible cookies on its own, and try dipping half of each cookie in chocolate for a gourmet twist. Use this mix as the coconut layer In 7-layer bars, or add some to cakes and other desserts to sprinkle In unique flavor.